These were her joys, her temporal blessings, that sustained her spirit while enduring much physical suffering and multiplying losses of ability. But always her mind, creativity and great holy spirit kept her strong and bright. She and S. Madonna Wagendorf were the first to commit to the newly founded Annunciation community. So new was it that Helen’s public nurse uniform became the pattern for the postulant uniform for decades to come. She and S. Madonna were still required to complete their novitiate year at St. Benedict’s in Minnesota, but were able to make first profession at home in Bismarck at the Cathedral with Bishop Ryan presiding. The Chinese have a saying, “Hope that you will not live in interesting times.” Times in the Annunciation community and S. Helen’s life seemed always interesting. She was called upon to tackle one challenging project after another. She had experience dealing with county and state health officials; surely she could remodel an old hotel in Beulah into a hospital and administer it. After that successful experience, surely she could build a new hospital and administer it in Bowman. From there she went to Garrison Memorial Hospital, the community’s own new institution, just to administer it for a time. With experience and training in anesthesia, she returned to Bismarck to St. Alexuis Hospital. Surely with that background, she could start a school of anesthesia. In 1960 she received from the University of North Dakota a certificate in hospital administration. Gee whiz, just in time! Actually, it was, for she became the administrator of the Richardton Hospital for twenty years. There she made many lasting friends from the civic community and the monastic communities of Assumption Abbey and Sacred Heart Monastery. Living alone in her mobile home, she grew a small garden of veggies, and another of exotic irises – huge incredibly colored blossoms, a gift from her brother in California. These she brought home with her when called to direct the Priory health center. Like a life-giving river flowing constantly beside her was her deepening monastic spirituality. Her Baptist practice of daily devotionals” with the Bible easily transformed to “lectio divina,” an ancient for of Benedictine prayer. Her spiritual reading included a good amount of Thomas Merton. She grew in contemplative spirit, especially during those years of near solitude in Richardton. I was blessed to help her find a hobby for her open hours. I had made some stamped embossed cards on wallpaper. She asked me one day if I thought she could do such cards, and of course she sure could. Up until the last few weeks, she was turning out these cards with her own special embellishment of fancy stitching around the edge. And Karla Monson brought her armloads of beautiful grasses which she made into artistic bouquets for foyer and chapel. This evening’s antiphon for the Magnificat, Mary’s song of praise, is taken from the past Sunday’s gospel which we found heart moving as we heard, “You also must be prepared, for at an hour you do not expect, the Son of Man will come.” Maybe she knew, but we didn’t, that in that brief hour of her having some lunch at St. Benedict’s, as S. Gerard and S. Donna did elsewhere, Jesus came to call her home. 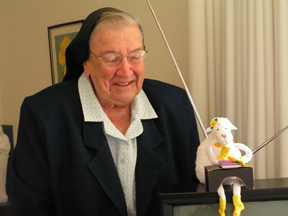 “This is a good life,” S. Helen said of her Benedictine life, but she surely has been brought to yet a better and more glorious one with God, the angels and saints. Surely, for once, she was fully prepared for that call!